With limited lab space aboard the ISS and skyrocketing launch costs, only the very best extra-terrestrial experiments make it into orbit. To put prospective experiments and astronauts alike through their weightless paces over the last six decades, NASA has relied on a gracefully arcing series of cargo planes called The Vomit Comet. These planes, traditionally modified US military cargo aircraft, generate brief periods of weightlessness by flying in parabolic arcs. By first climbing at a steep 45 degree angle, then reducing thrust and leveling out the nose of the craft as it travels over the "hump" of its flight path, the planes can simulate a zero gravity environment (really both the plane and the passengers are in a slow free fall) for about 25 seconds (out of each 65 second parabola) before the nose of the plane is tilted down at 30 degrees, thrust is added, and everybody aboard endures 2 G forces through the descent and lower "trough." The process is then repeated 40 to 60 times each training session. 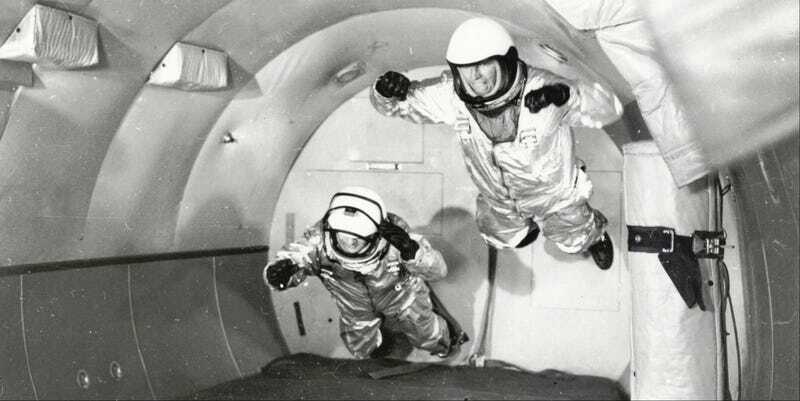 These weightlessness training flights began in 1959 when Project Mercury astronauts including Alan Shepard, the first American in space, practiced aboard a C-131 Samaritan and were the ones to bestow the "vomit comet" nickname on account of the horrible motion sickness the experience can invoke in some passengers. As the Space Race exploded after Shepard's famous flight, the original Samaritan was replaced in 1973 by a pair of modified KC-135 Stratotankers which served for nearly 30 years—training the space-farers of the era in the ways of zero gravity as well as appearing in a number of films like Apollo 13. It's estimated that the primary KC-135A, the one used in Apollo 13, completed nearly 60,000 parabolic maneuvers between 1973 and its retirement in 2000. It's counterpart flew an additional four years before being put on permanent display at the Pima Air & Space Museum in Tucson, Arizona. But the retirements of these venerable planes did not spell the end of the vomit comet line. In 2005, NASA acquired a pre-owned McDonnell Douglas C-9B Skytrain II from KLM Royal Dutch Airlines and uses it for parabolic flights. Additionally, NASA maintains a service contract with the Zero Gravity Corporation (ZERO-G) for use of the company's weightless training aircraft G-FORCE ONE, a modified Boeing 727-200. While the company charges normal folks like Penn and Teller, Martha Stewart, and Stephen Hawking around $5,000 for the experience, ZERO-G has provided the test-bed for NASA's FASTRACK Space Experiment Platform in 2008 and has been been cleared by the FAA to "...offer reduced gravity parabolic flights to prospective suborbital launch operators to meet the applicable components of the crew qualification and training requirements outlined in the Code of Federal Regulations (14 C.F.R., Section 460.5)."